Passing the Turing Test: Tread Lightly! In 1950, Alan Turing posed an interesting question: can machine intelligence become human-like enough that the average person would not be able to distinguish the difference between man and machine? Thus, the Turing test was born. Turing explains the test using a scenario in which a human interrogator asks questions of two parties, of which one is a human and the other is a machine. Knowing that one is human and the other is not, if the interrogator can’t reliably determine which is which, the machine is said to have passed the Turing test. There is a variety of Turing tests, but all contain text-only interrogations; a robotic voice is simply too much of a giveaway. While we now refer to these intelligent machines as artificial intelligence (AI), the Turing test remains relevant. The application of artificial intelligence to self-service seems like a match made in customer service heaven. Customers like and prefer self-service options, while artificial intelligence capabilities allow machines to perform complex tasks better and faster than humans ever could. 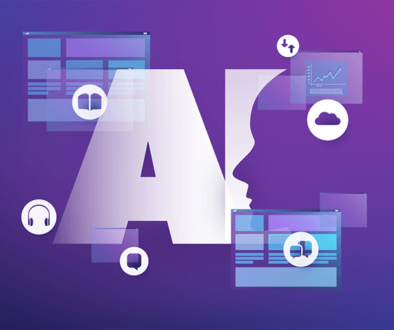 Some of the more advanced automation incorporates AI into self-service channels, commonly including the web, chat, and phone, among other channels. 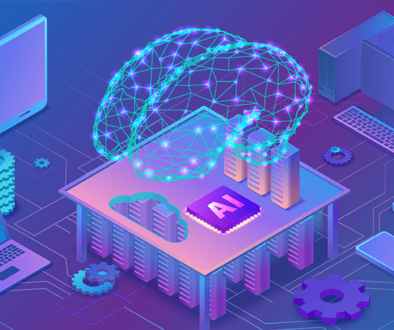 And as AI continues to improve across more applications, companies are feeling the pressure to utilize its capabilities in a way that both benefits their customers and saves money. For certain self-service channels, like web search, there obviously isn’t a bunch of really smart guys on the other side of the search bar scanning the internet as fast as they can for what we need. 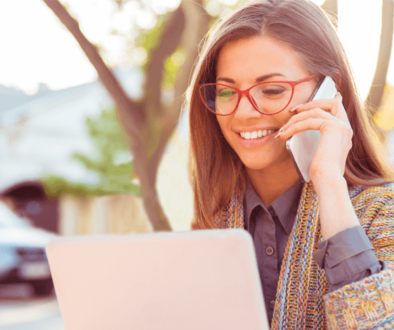 But for the channels that are more conversational in nature, such as phone, chat, or text message, there’s always the chance that the first contact might be with a machine. In other words, each time you initiate communication in one of these channels, you’re the interrogator in a Turing test of your own. These channels, when not being operated by a live agent, likely employ some type of AI to provide relevant responses and maintain the conversation. Pretty cool, huh? Well, there’s a problem with blindly advancing artificial intelligence. The reality is, as a certain technology becomes more and more human-like, it follows a trajectory similar to a power function (high school algebra, anyone?). At a certain point, the humanness becomes creepy and unsettling – it’s human-ish, but something feels off. Think Ava from the movie Ex Machina. The emotional discomfort we feel when this happens is known as the Uncanny Valley. As you can see, there are two peaks on the graph, with the second peak representing a point of technology that we haven’t yet reached. And since we’re not at the second peak technologically, you shouldn’t go over the first one. The idea is, we want to stay at the first peak and advance it as much as possible, without falling into the Uncanny Valley between the two peaks. A recent recap article of Call Center Week in Orlando mentioned “humanizing [self-service] technology” as a key focus for attendees. There are a lot of ways to humanize technology – i.e. using 100% natural language, and referring to customers by name – while keeping it on the first peak and out of the Uncanny Valley – i.e. keeping familiar robotic voices rather than using voice talent. When you account for the Uncanny Valley, passing the Turing test becomes a challenging balancing act for companies who employ smart customer service technology. Sure, you want to use advanced technology for great service that is comparable to a live customer service rep; but you definitely don’t want to creep your customers out! 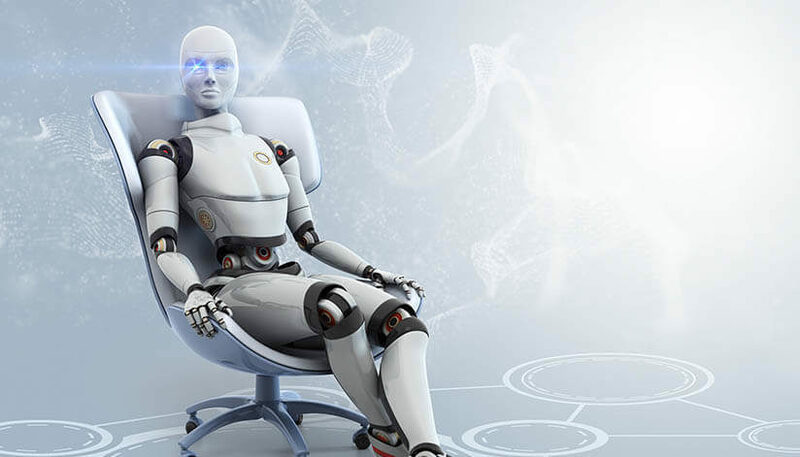 As you evaluate your current and future self-service technologies, especially those that involve some form of artificial intelligence, keep in mind the fine line between the Turing test and the Uncanny Valley. 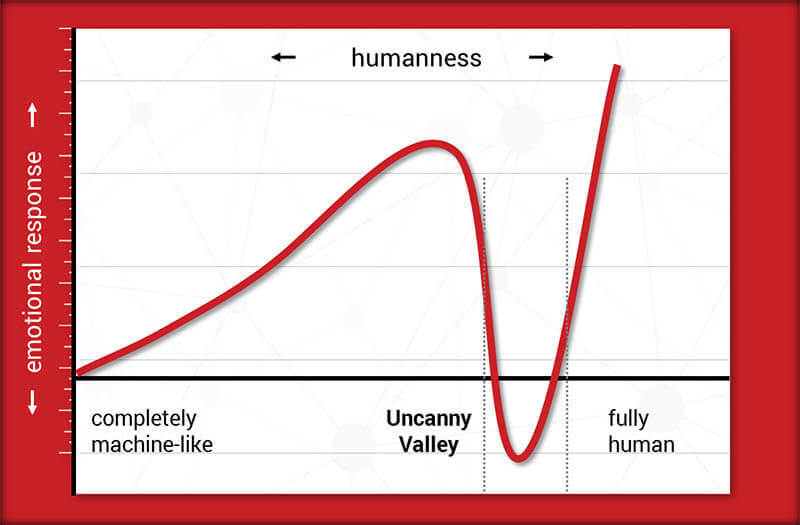 The million dollar question is: how can you continue to push the peak before the Uncanny Valley higher? The future will undoubtedly bring more self-service options, powered by AI, that are much improved and sit atop a higher peak than today’s channels. 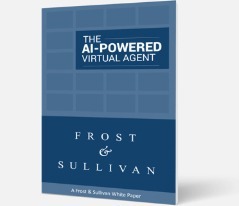 Start implementing AI into your contact center now, and you’ll be able to stay relevant as the future arrives.